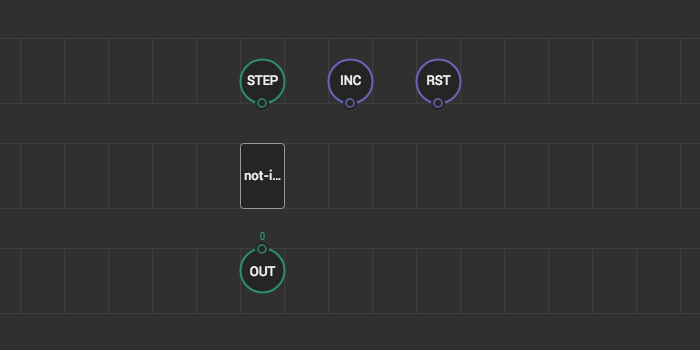 Nodes outputs of which depend solely on their inputs in at any point of time are cool. They easy to understand, test, and compose. But building a useful device using only such pure nodes is not realistic. Someone needs to keep state along program run time. A node can define state data that will persist for the time the program executes. In other words, a node can put some value to the state in evaluate call and retrieve that value in any of subsequent evaluate invocations. Let’s make a simple count node that will increment a value by one each time a pulse is sent to it. Also, we’ll make the step size configurable and provide a pulse input to reset the counter to zero. Note XOD standard library already includes xod/core/count node with similar functionality. But let’s forget about it for a moment. As always, when you make a C++ node, start with a new patch, add required terminals, and the not-implemented-in-xod node. It’s a good idea to provide a resonable default value for STEP. We’ll set it to 1. Double-click on not-implemented-in-xod node to open the code editor. All state values, regardless of type, start with their default values. The default value for numbers is 0 anyway, so this initialization of counterValue through assignment is not required. Although the definition of the field is necessary, of course. We set it to 0 here just to demonstrate a possibility to initialize with another value like 42. The state is just a plain pointer to the State instance. Of course, you may use its fields directly without any intermediate variables. As you know from Data types article pulses have no values. To check whether a pulse on the pin was fired in the current transaction we should use isInputDirty function, not getValue. It doesn’t read values, instead it returns true if an upstream node just emitted a new value for the pin specified. // avoid emission of a duplicate value. // Emit the updated value accessing the field directly. The State struct is not the only thing which keeps data across transactions. Any node owns its output value as well. And the getValue function is allowed to access the most recent values set on outputs. Note how we changed the order of pulse checks to preserve the priority of RST pulse over the INC pulse. Well done! The node is ready. Use a couple of buttons and a watch node to test and play with it. Using persistent state is easy. Remember though, data stored in it consumes RAM. Also, stateful nodes in many cases are more complicated than their pure counterparts; it’s easier to seed a bug in it. Use them with care. When possible, split a big stateful node into two smaller nodes: a stateful thin node and pure fat node. In other words, try to keep the most functionality in stateless nodes.